How did Israel come to be ruled by Kings? What do we learn from the Kings of Israel? How does this relate to Jesus and the reasons why he came? Does any of this have relevance for our lives? ​Come along and join us as we explore some of the Kings from the Old Testament and look at how the lessons they learned can still help us in our faith today! This May Mission Month we're taking a look at local mission, with a focus on 'share a coffee - share a story'. Across the month it would be great if we each aim to sit down with someone, share a coffee (or other drink) and share some of our own story, as well as hear their story. Easter is a significant time in the Christian tradition. It is when we celebrate what is at the very core of faith, the life, death and resurrection of Jesus. What is easter really all about? What do we need to know about Jesus to be 'saved'? Come and journey with us as we look more closely at the cross and the message of the Christian faith. Over the past 100 years western culture has changed incredibly. In the early 20th century, most people went to church. Now, there's almost more chance of someone asking the question 'what is a Christian' than there is of speaking to someone who is connected to a church. Though our culture has a strong Judeo-Christian heritage, many people today are completely unversed in what we've known as a Christian culture. During March we're going to take some time exploring these cultural changes and asking the question 'how do we share the best news in the world in a way that our friends, family and neighbours can hear it and understand it? The message is still the same, but perhaps the changes in our culture affects how we should share the message more than we realise? Over the months of January and February we're looking to have a conversation as a church; 'What is God calling us to, what is His vision for our faith community?' We'll be proposing a statement that we believe the Lord has led us to, then we'll be journeying with each other as we seek to answer the question 'Is God in this?' as a church family. The proposed vision statement is: "We desire to be a loving, vibrant Christian community intentionally seeking to support family life." Our sermon series during this time will seek to unpack the reasons we believe God is calling us towards this aim, as well as explaining more specifically what we believe it will look like. We want the whole church family to be part of this discussion and so we will be facilitating various times for this to take place throughout January & February as part of our church services. What is the real reason we celebrate Christmas? How do we focus on this during the 'silly season'? Do we need to re-capture 'Christmas'? Come along during December as we take a look at Jesus: The reason for the season. A life of faith is all about finding the rhythm of God in our lives, or as it is worded here, 'the unforced rhythm of grace'. However, this kind of life takes discipline. It can be formed, but it won't just happen. So how might be learn the unforced rhythms of grace? Christians since Christ have practised various spiritual disciplines that have helped them in this pursuit. Some are still well followed, others have become less popular. We're going to look at six possible disciplines that you may like to explore in your life. During September and Early October we'll be having various people speak to us on different topics. What is faith? We've recently adopted a new mission at Craigie which talks about 'seeing faith stories happen'. We're setting out to journey with people towards Jesus. A journey is simply a series of steps. Journeying with people towards Jesus means helping them take steps of faith, becoming more like Christ...but what does that look like? Throughout July & August we're going to learn from faith filled characters throughout the bible. What is our next step of faith at Craigie? 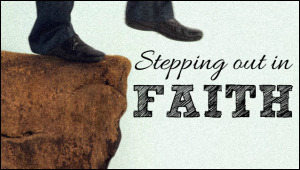 What is your own next step of faith? This is what we hope to help answer over these months. One of the few taboo topics in our culture is money and yet money is a topic that Jesus spoke about a lot, tying it closely to spiritual maturity. Some churches talk about money a lot leading to the question 'Does the church just want our money'. Others barely mention it. We're going to take some time in June to see what the bible has to say about money, about giving to the church and about what it means to live a generous life. Each year at Craigie we celebrate 'May Mission Month'. Throughout the month we'll be looking at various mission items, hearing from people involved in mission locally and globally and considering how we as a church can be on mission in our own context. We live in a constantly evolving world. In some ways these changes are good and in some ways they are not so good. However, as the world does not stand still neither can the church. How do we at Craigie Baptist Church reach our friends with the good news in the 21st century? What does it actually mean to be sent into the world? Come along to Craigie in April and journey with us as we explore evangelism in the 21st century. One simple question, who do you think Jesus is? In the lead up the Easter we're going to be exploring the idea that the entire Christian faith hinges on one question, 'Who do you say I am?'. Everything hinges on how you answer this question. Do you have questions about Christianity? Do you struggle to understand or believe the story of Jesus? We'd love you to come along and journey with us as we prepare to celebrate what Christ did for us at Easter. Welcome Home. That's how we want people to feel when they first come to Craigie Baptist Church. That is what many people at Craigie suggested as a 'memory' when asked about their time at Craigie, it just felt like 'Home'. What does Home look and feel like to a world in need? What might it look like for us to be Home for those outside faith today? Join with us throughout the end of January and through February as we journey together, beginning to discover the New Craigie that God is calling us to be.